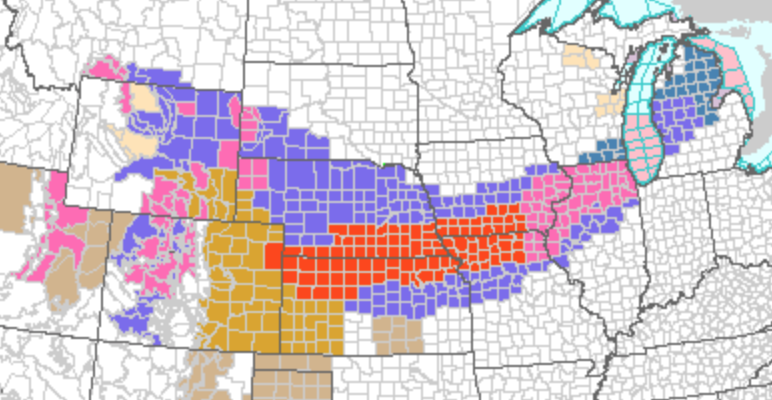 The blizzard warning has been extended from near Burlington, Colo. (on I-70), into northern Missouri and southwest and south central Iowa. A winter storm warning has been extended all the way ENE to Chicago and a winter storm watch is in effect for Milwaukee which may be upgraded tonight. Please factor this into your travel plans as the airports in Chicago and Milwaukee will be a mess when the snow begins (waivers have been issued by the airlines) and it is unlikely you wish to drive through a blizzard. 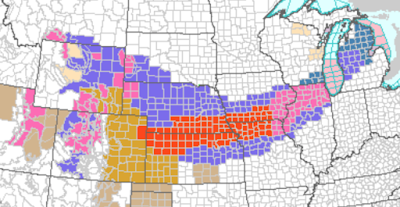 Finally, the gold-colored areas are high wind warnings.